On the wheel's outer rim we have a figure resembling Anubis (on the bottom), the Egyptian lord of the dead, indicating, perhaps, endings and things coming to a close in our lives, a snake on the opposite edge, symbolizing trouble and difficulties, and at the top, a sphinx armed with a sword, indicating intelligence and wisdom, and the ability to discern the best course of action in each situation. Outside of the wheel are four figures, each consulting a book- a lion, an angel, an eagle and a bull. Interestingly, they all have wings, also. However, these four figures represent the four aspects of humanity- the eagle representing far sight and intelligent planning, the bull representing strength, the angel representing dominion over the world (keep in mind, it's power with, not power over) and the lion representing willpower. 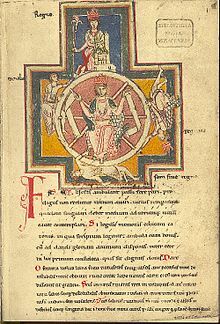 The concept of Fortune's wheel, the rota fortunae in Latin, is a fairly common concept in medieval literature. It is spun by Fortuna, who usually is depicted outside the wheel. She spins it at random, causing misfortune to some and good fortune to others. However, as time went on, Fortuna's wheel became more of an allegory, telling how things of this world are transitory, and prone to change at a moment's notice. Actually, this provides an insight to the meaning of this card- we are, it's true, sometimes subject to changes and forces beyond our control, much like the storm currently wending its way towards the east coast at this time of writing. However, the message here is not to blindly accept fate, blindly accept whatever changes come to us, and view ourselves as helpless pawns at the mercy of a much greater force. We know wheels turn, so can act according to that. True, some things come out of the blue, but we can do two things- first, be able to let go and accept change, and second, to prepare for that change. This isn't saying stock up on ammo and prepare for the zombie apocalypse, but rather the old adage about putting all your eggs in one basket, and counting your chickens before they're hatched. Be flexible, says this card- first, use the positive changes in your life to prepare for the future, and remember that during the bad times, things will get better. 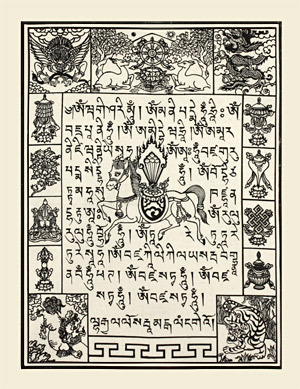 Luck, as they say, favors the prepared, and this to a large extent is the message of the Wheel of Fortune card. In context, this is a card that bears examining. What surrounds it? The card itself indicates change, but whether or not first, we perceive that change as positive or negative, and second, what we do with it, determines whether it's for the best or not. Again, we are the ultimate authors and deciders in our own lives, either consciously or unconsciously. And this is one of the best uses to put the Tarot to- not to have someone tell us what to do, but rather to show us more options, and make a more informed decision.